Preheat your frying oil. Crack the egg in a shallow bowl and whisk in the Tabasco. Place the breadcrumbs in another shallow bowl next to the egg bowl. With a chef’s knife, split the frog leg pairs apart from each other. Dip each leg first in the egg and then in the breadcrumbs- you want to coat each leg with egg to then evenly adhere the breadcrumbs. Set aside each leg when you’re finished. Depending on the size of your fryer/pan, fry as many legs as will fit. (For our Fry Daddy, 4 is a comfortable amount.) You want them to be golden brown (they will further darken when they’re out of the oil) and this will take approximately 3-4 minutes per batch. Remove from the oil on a paper towel. Do the second batch if necessary. 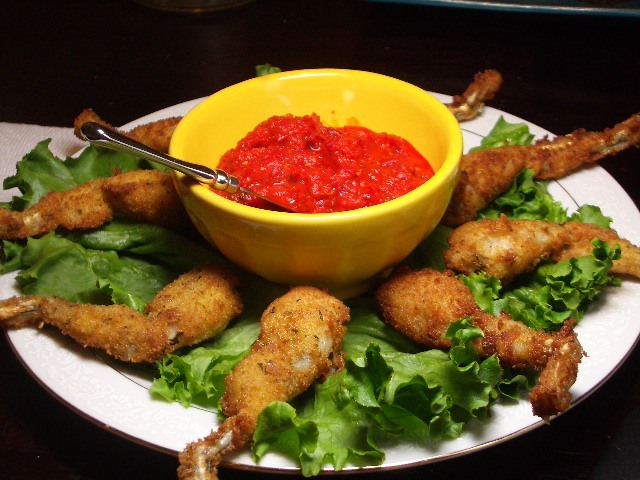 As you can see from the picture, we served these over a bed of lettuce around a dipping bowl. We used Trader Joe’s red pepper spread as our dip, and it was delicious. A homemade red pepper dip would also be good, but a basic marinara sauce wouldn’t do bad either. ENJOY!